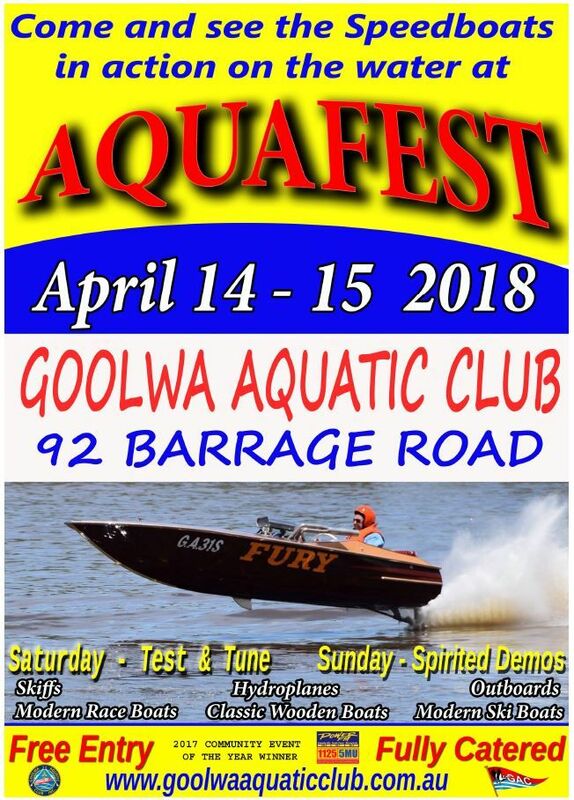 Entries are now open for our 2018 Aquafest. Your entry covers both days, only boats entered will be able to come into the pits on both days. so that there is no more jostling for position on the Saturday. The pits will be set up so you will have your own space. Love having you guys come over. So who's going to the Aquafest? After a couple of false starts we are going with Ronda. Keep your eyes on the road I'll be following you watching the boat. We'll be there but I've only entered a static display. I'll be available for test drives though! Look forward to catching up with people. Back safe and sound from Goolwa. Another great event....well run as usual ! Ronda did all that was asked of her and apart from some broken rudder bush bolts came back unscathed. Would like to thank Michelle for crewing for me after Carol broke down with a bad back. Ronda seems to work better with two people up front, with no passenger she leans over and becomes a bit difficult when following other boats. For all those who have contemplated Goolwa and not made the trip, this really is a first class event. Bring on next year! It is a great event.